Susie Burch Art: The first post on my brand new blog. The first post on my brand new blog. I am launching into the 21st century by creating a blog about myself, my art work, and all the trials, and joys of living each day as it comes. Some of the entries will be personal while others will be about how I create art. Who knows what I'll come up with. Thank you for coming on this journey with me. In September, 2009, fellow artist, Lorie Merryman, and I spent the best part of a week painting en plein air (on location, completing a painting all at one time) on St. Simons Island on the Georgia coast. The image above, left, is of the light house. The beacon from the tower has guided ships safely toward Brunswick, GA, for a long, long time. Everyone that has visited St. Simons Island has stood on the same spot to look up at the tower in wonder. Many folks venture inside of the historic home to visit the museum and to climb the light tower to be greeted with a spectacular view of the Atlantic ocean, and of the island. The morning Lorie and I painted at this location, we met about a dozen people that were interested in what we were doing, and why we were painting on the island. 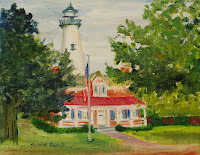 Our answer was consistently that we loved to paint, we loved to be outside, we loved to meet new and interesting people, and we loved to be on St. Simons Island. During our adventure we both created 6 new paintings in 4 days. Wonderful, indeed!! People often ask me how long I have been painting, and the answer is most of my life. I enjoyed spending time doodling with my new box of assorted Crayola crayons when I was very young. The only problem I had with coloring books was "coloring inside of the lines," because I always wanted to run the color over the edges to make the "picture" more interesting. I guess I have always walked just outside of the box where it is more exciting. When I make art, my soul sings. Through my work, I share with others the joy I find in the simplicity of a flower, the quiet of a long country road, the nostalgia of an old bicycle left behind, as well as the appreciation I have of people working, or playing, or taking care of everyday tasks. Life is what we do, and that is what I wish to capture and preserve. Please visit my web site at susieburch.com to see more examples of my work. I'd love to hear from you. Susie working in her studio.